NOTE: This content is old - Published: Friday, May 25th, 2012. 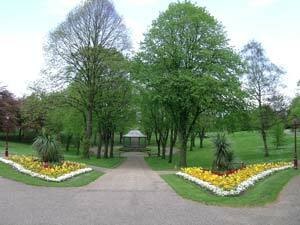 Wrexham’s Bellevue Park has been revealed as the most visited free attraction in North Wales according to a new survey. The park attracted 384,000 visitors in 2011 and was the only North Wales attraction to make it onto the top ten list finishing in fourth. Bellevue Park was built in 1910 and was built to commenerate the jubilee year of the incorporation of the town and celebrated its centenary year in 2010. As well as its beautiful gardens the park has tennis and basketball courts, a bowling green, children’s play areas and a bandstand which in recent years has been home to an annual music festival. In 2000 the park was extensively re-furbished to it’s original Edwardian period condition thanks to lottery funding. In the list of paid attractions Wrexham’s historic Erddig Hall came ninth pulling in 168,281 visitors, nearly double what it achieved in 2001. The survey by Beaufort Research shows that last year 15.8 million people visited the 214 Welsh attractions that participated in the survey, with visits to free attractions representing over half (57%) of all visits. Business Minister Edwina Hart said: “Tourism is one of our key economic sectors, worth £4.2billion to the Welsh economy each year and visitor attractions are an important component of the industry.